Plans to transform a vacant 60-acre site adjacent to the Westchester Medical Center into a bioscience, technology and lifestyle campus have taken a major step forward in the approval process. The $1.2 billion project, which has been in the works for nearly a decade, was presented to the Mount Pleasant Planning Board by representatives of Fareri Associates. The Planning Board is now expected to schedule a public hearing on the project’s scoping document in May. Known as the North 60 project, the development will include three million square feet of biotech-medical technology space, research and medical office space; neighborhood-style retail; a hotel with conference facilities; a health and wellness center and structured parking. The first phase of construction, including infrastructure, is expected to begin in the fall of 2020. 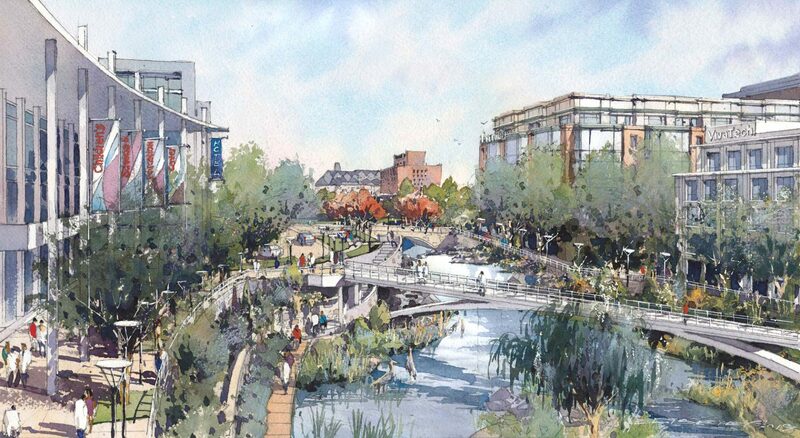 The North 60 campus will have a pedestrian-friendly Main Street lined with shops, restaurants with outdoor dining, landscaped plazas, pedestrian bridges and bikeways connected to a regional bike network. It will also include a first-of-its-kind Children’s Living Science and Learning Center. Along with creating an educational experience, the facility will provide career training and job readiness programs in the bio-tech and research fields for area residents. In January, Westchester County Executive George Latimer signed a 99-year lease for the 60-acre site which is owned by the County. Fareri plans to combine the North 60 property with 20 acres of adjoining land already owned by the firm. When fully developed, the North 60 is expected to generate an estimated $9 million in annual real estate taxes to the County, Town and Mt. Pleasant School and Pocantico Hills School Districts. The project will also generate an estimated $7 million in new annual rent to the County. Fareri is prepared to fund infrastructure improvements and enhancements required to develop the site, including sewer, water, storm-water run-off, traffic, safety, wetlands and other environmental issues. The North 60 is expected to have a natural symbiotic relationship with the nearby Westchester Medical Center and the New York Medical College’s Biotechnology Incubator offering opportunities for a range of collaborations. The North 60 is also in close proximity to Regeneron Pharmaceuticals, a leading biotechnology company in nearby Tarrytown. The project will create more than 4,000 new construction jobs and 8,000 new permanent jobs. It will also create career opportunities for students in the emerging bioscience field by forming partnerships with nearby Westchester Community College, Pace University and New York Medical College. Greenwich-based Fareri Associates, founded by John Fareri, is a builder of both commercial and residential properties in the Westchester-Fairfield area. Among its property portfolio, the company owns and manages 19 Bradhurst Avenue, the largest medical and research building of its kind in Westchester.